Eggs in a Pumpkin are a beautiful way to put fall on your table. These mini pumpkins have been baked with eggs inside and nestled on a Bacon and Roasted Squash Hash. They are perfect brunch dish for company or just because it’s Fall. Ok, I know it’s fall. It has to be fall… somewhere it has to be fall. How do I know? Because the grocery store is filled with pumpkins and squashes of every size and every color. I even spotted crates filled with my arch nemesis, the dreaded Brussels sprouts. Pumpkins can only mean one thing, it’s time for my annual fall ritual. Every year, I see these baby pumpkins at the market and fill the child seat of my grocery cart to the brim with the cute little things vowing to find a way to use them. And, every year, they sit on my counter and get in the way while I bake other things. If the pumpkins are lucky, I may get in a “crafty” mood and use them as a center piece or a flower arrangement or a place tag on the table of our annual “Very Merry Un-Thanksgiving Dinner.” As the weeks go by, the pumpkins get covered with Arizona dust and brown spots and I must make yet another “new fall’s” resolution… find a way to use them next year! Well, this is it! This is the year that I come through on my promise to all the little pumpkins who have come before. I have found a way to use them! Don’t laugh, it’s not as easy as you think. You can’t do just any ol’ thing with little baby pumpkins. They are far too cute to throw into a food processor and hit “puree.” But,they aren’t really big enough to fill with hot soup or fiery chili. Not if you are feeding grown men and teenagers anyway. This year, I decided to make mini pumpkins the main attraction of our weekly “breakfast for dinner” night. Genius! I know. They are the perfect size to hold exactly one egg. Don’t panic! The Eggs in Mini Pumpkins are much easier to make than they appear. It only takes a little chopping and scooping of seeds. You can even throw them in the oven on the same pan with the Bacon and Roasted Squash Hash I made to go with them. Better yet, if you cover the sheet pan with foil, you might not have to wash it! Add some bacon slices and toast with jam and you have an entire breakfast, brunch or dinner. So, where did I get the inspiration? Have you seen all of the “eggs in a _____” photos going around the internet? The Eggs in an Avocado and the Eggs in an Onion photos? And don’t forget the Flower Power Eggs in bell pepper rings that started the craze? Well, you may not realize that the “Eggs in a _____ ” sensation was started by my very own sister, Donna Kelly. That’s right the co-creator of our very own Everyday Southwest. Ya, that Donna. I’m sure I don’t have to tell you how awesome it is to blog with a partner that is so creative and fun and that inspires me all the time. But (just between you and me) her Flower Power Eggs are a little hard to live up to. Talk about pressure. I have been thinking and thinking of something special to do with eggs and “Bam!” here came these little pumpkins. No. No sibling rivalry here, just a little fun inspiration. Give this recipe a try for a fun fall dinner or weekend breakfast. I’m sure your family will be just as impressed as mine was. Just remember that the eggs will keep cooking a little bit after you remove them from the oven so, if you put the lid all the way on for that “Surprise!” factor, put the lid on at the very last minute. Use your own imagination of fun things to serve with them like the Bacon and Roasted Squash Hash in this recipe or roasted potato hash or cornbread muffins… anything that sounds like fall. Cut the tops off the mini pumpkins about one third of the way down the pumpkin so that the top makes a nice lid but the center of the lower half is deep enough to hold an egg. Scoop out the seeds and use a spoon to scrape away any of the membrane to make a nice smooth bowl. Cover the stems with foil. Place the pumpkins on a foil lined baking sheet, cut side down. Set aside. With a chef's knife or a knife that you are comfortable handling, carefully cut the red kuri or butternut squash into sections. Remove the seeds and stem. Microwave the squash sections to soften them and make them easier to dice, about 3 to 3½ minutes. Peel the squash and dice it into ½ inch diced pieces. Whisk together the vegetable oil, balsamic vinegar, chile flakes, garlic. To serve, spoon the hash onto plates and nestle the pumpkins in the center. Lean one top of a pumpkin on each pumpkin. 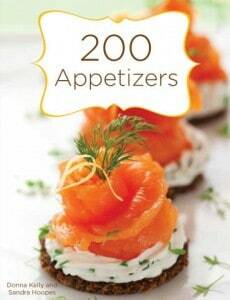 Don’t forget to check out our 200 Appetizers Cookbook! Order now so you will get it before the holiday party season starts Our Awesome publisher, Gibbs-Smith is offering 35% off to help us celebrate. But! You need to hurry! The offer is only good through October 31, 2012. Just enter the discount code “apps” on their website to receive your discount. You can follow me on twitter and “Like” us on facebook. We love hearing from you. Oh. MY. Gosh. YOU are the inspiring one, Sandy. These are just darling! Just changed my dinner plans! Hahaha. Brussels sprouts are my favorite food. Seriously. Mmmmmmm.